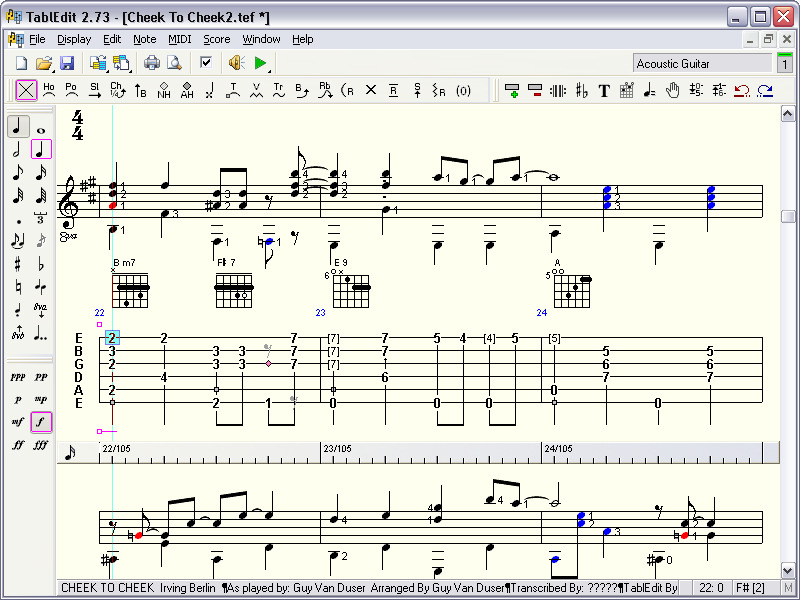 ablEdit is a program for creating, editing, printing and listening to tablature and sheet music (standard notation) for guitar and other fretted, stringed instruments, including mandolin and bass. Additionally, TablEdit, while designed for guitarists, by guitarists, is not limited to guitar like other Tablature programs. Through ongoing consultation with experts on other instruments, TablEdit has developed support for harmonica, mountain dulcimer, diatonic and chromatic accordion, drums, violin, tin whistle, recorder, xaphoon, native American flute, autoharp, pedal steel guitar, and banjo (even taking into consideration the special aspect of the fifth string). TablEdit can open/import ASCII, MIDI, ABC, MusicXML, Bucket O' Tab, Guitar Pro, PowerTab, TabRite and MusicXML files. Files can be saved in TablEdit format or exported to ASCII, HTML, RTF, ABC, MusicXML, MIDI, Lilypond or WAV formats.